Although this year’s Consumer Electronics Show only officially kicked off yesterday, we’ve already seen a flurry of announcements relating to products that bridge the gap between the PC and TV or bring Internet content directly to a television. Here’s a roundup of some of the more interesting devices and services announced. The long-delayed SlingCatcher from Sling Media is being given its first public demo at CES. The device serves three purposes: getting content from a SlingBox (the company’s place-shifting device) onto a TV, playing back media stored on an attached USB hard drive on a TV, and viewing Internet content via a PC on a television. To achieve all of this, the SlingCatcher comes bundled with three applications. SlingPlayer for TV, SlingSync and SlingProjector. SlingPlayer for TV delivers the much requested feature of being able to “sling” programming directly to another TV in the home or to a TV in a remote location over the Internet. Previously, a version of SlingPlayer was only for PC (Windows/Mac) and a number of mobile operating systems, but didn’t run on its own dedicated set-top box. The SlingCatcher/SlingPlayer for TV combination delivers this option. The SlingSync application gives the SlingCatcher some AppleTV-like functionality, enabling media stored on a networked PC to be synchronized and played back on a TV via a USB hard drive attached to the SlingCatcher. Unfortunately, both SlingSync and SlingProjector require a Windows-PC. Hopefully Mac-support will be forthcoming. 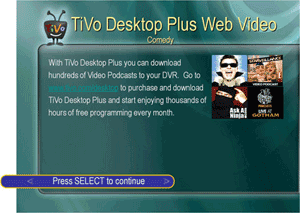 TiVo Desktop 2.6 allows you to monitor a folder of video – which is automatically transcoded and transferred to a networked TiVo. What’s new is the whole element of automation… Here’s one example of how you might put this to use: Subscribe to various video podcasts via iTunes, have TiVo Desktop monitor that folder, and specify the number of videos (of each podcast) the TiVo should store (as shown above). Once that setup is complete, whenever your PC is powered up new videos are automatically transcoded and transfered – meaning, video content resides on the TiVo and doesn’t require the PC stay powered on for television playback. In other words, it enables a TiVo to operate much like the AppleTV, in terms of automatically syncing new content downloaded on a PC for playback on a television. Sharp, Samsung and Panasonic have all made announcements relating to bringing Internet content directly to new television sets, specifically through the ability to run “widgets”. Sharp is launching a service called Aquos Net, which will work with the company’s newest line of HDTVs to deliver news, stock quotes, weather and other non-video content from the Internet via configurable on-screen widgets. Rival Samsung announced a partnership with USA Today to offer something similar, whereby news, local weather, and other information from the newspaper’s site will be delivered onto high-end Samsung TVs. The TVs, to be launched this spring, will allow users to directly browse and access videos from YouTube, a video-sharing Web site owned by Google, and view Picasa Web Albums, a free online photo-sharing service from Google. We’ve previously speculated about Google’s potential plans to enter the set-top box market, which could even involve an open platform similar to Google’s Android for mobile. It might well be be that partnerships such as this one with Panasonic are a cost-effective way for Google to see first if consumers really do have an appetite for Internet-connected television sets. I like the SlingProjector. Sounds like a great idea. 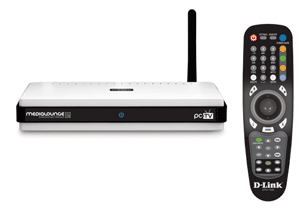 The PC-on-TV Player actually competes with the alternatives mentioned on more than one front. Not only does D-Link give you access to net content, you are also able to browse and bring content stored on your PC to the living room screen – whether it’s family photos, mp3s, DVD playback or PowerPoint presentations for work. what type of tv is the best for connecting to internet?